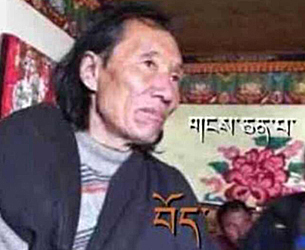 (TibetanReview.net, Feb11’16) – A Tibetan man jailed for 13 years for refusing to fly the Chinese national flag under a patriotism drive in Driru (Chinese: Biru) County of Nagchu (Naqu) Prefecture, Tibet Autonomous Region, has succumbed to severe torture during his detention, reported Radio Free Asia (Washington) Feb 8. The victim has been named as Trigyal and the report said his body was recently turned over to his family. No further details were available about the man apart from the name of his village and it was not clear when exactly he died. The report said Trigyal was one of three men belonging to Mukhyim village in Driru County who were given lengthy jail sentences for refusing to fly the Chinese national flag over their homes during an official drive in 2014. At that time some of the more than 1,000 residents of the village protested against the order and some of them threw the flags they were given into a nearby river. Following Chinese crackdown, Trigyal, apparently seen as the main ringleader, was jailed for 13 years in 2014 while two other men – named as Ngangdrak and Rigsal – were given 10 years each. The vigorous patriotism drive, launched in the county in Sep 2014 and intensified over the following weeks, had led to about 1,000 Tibetans being detained in the county, the report added.